So maybe not exactly number 4,598, but it sure seems like it. I’ve been showing my thrift store, estate sale and yard sale finds for roughly four years now, so it has to be up there somewhere. Do you see the weird number 8 in my title? Come on down here little guy and join the rest of us. Not sure what’s up with him. So, lets see what I found recently. OK, this is probably one of my favorite finds. An old Maxwell House Coffee tin. No lid to it, but still, it has some pretty sweet graphics on it. Not sure how old it would be, but it mentions steel cut percolator grind, so maybe mid-century??? When did people stop using percolators? 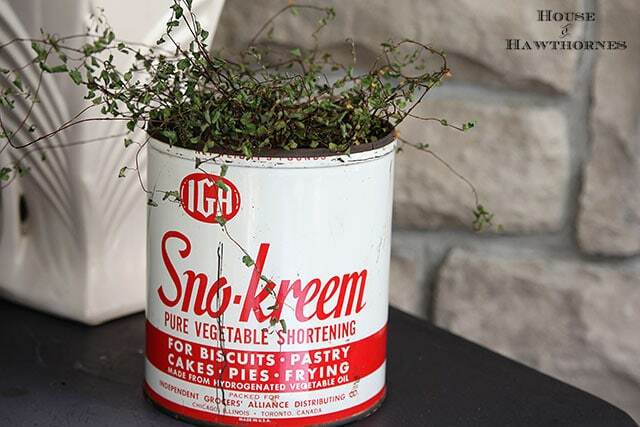 I found this IGA Sno-kreem shortening tin a few weeks ago (that I totally forgot to show you), so I guess I’ve been on a tin roll. The local IGA was our grocery store when I was a kid. The only grocery store in town to be exact. So when I saw this I grabbed it up. Again, no lid, but I wasn’t going to let that stop me. 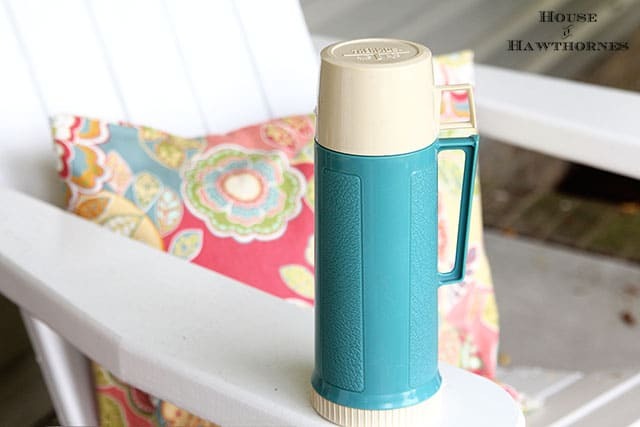 and this vintage turquoise Thermos bottle for $2. Both at a little out of the way antique mall. They have a bunch of what they consider to be junk outside on their front porch. One man’s junk is Pam’s treasure. 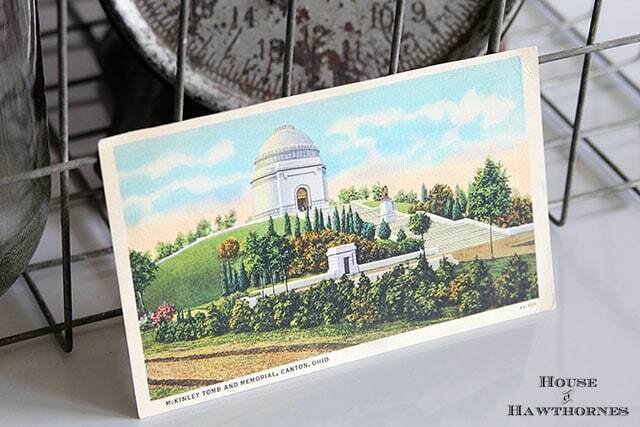 and this McKinley monument postcard from Canton, Ohio for 50 cents each. We used to go to this place ALL THE TIME when I was a kid. The 108 steps up to the monument are killer. People nowadays use it for a workout. I used to run up and down them without breaking a sweat when I was a kid. I always wonder what the President would have thought of people running around and playing on his grave. Oh, and I bought a toolbox. I was initially thinking of making a planter out of it, but I really don’t need another planter. Already have one in my kitchen to hold kitchen tools. And one made into a cell phone charger type thing. And of course I have a few in my office to hold craft stuff. Guess I could use it as intended, but I don’t need another toolbox used as a toolbox either. So now my goal is to use it for something different. Any ideas of something amazingly fun to do with it? Out of the proverbial box? Unconventional, yet useful? Hmmm, how about a silverware, napkins, salt and pepper shakers, and glasses holder for a backyard picnic? My have the same coffee tin in our garage. It was originally in my grandfather’s wood shop and Chris inherited it when we bought their house a long time ago. I still love the graphics. Maybe I need to steal away from Chris. I’m also loving the idea of you using the nifty red toolbox for a fun picnic type carrier. It’s the perfect color for a fun patriotic vignette. Maybe filled with lots of vases or bottles with American flags? Have fun! Can’t wait to see what you do with it. I really like your coffee tin, Pam. I’ve started collecting some of them and decided if we ever build a guest house, I’m going to use several, flatten them out and use them as a kitchen backsplash. I saw a similar thing done with oil cans once — I think it was a tabletop? — and it was really quite lovely. 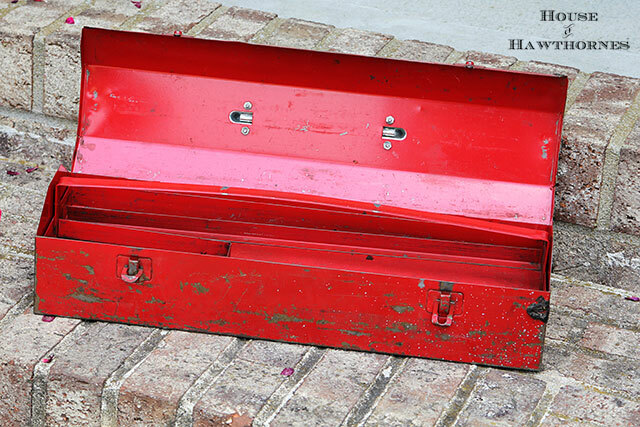 Great little red toolbox also — it would look great on a bookshelf! I currently have three old toolboxes waiting for inspiration, so I am now help there. I do have one filled with plants with all my Jello Mold toadstools arranged in it and around it. That looks pretty cute. Oh, and Gnome. Gotta have a gnome. IGA is our only grocery store in town (until the Walmart opens next month). It’s kind of a grubby hole in the wall store, but occassionally I do got there for one item or so. When my son was about three or four, we stopped in for something. As we were crossing the parking lot, he looked up at the sign and said, “I G A – HEY! I can SPELL that!” Still a favorite memory thanks for the reminder! Love the coffee and shortening cans. For a while I collected old toolboxes too. So neat! You sure find good prices where you live. Those cans would be much higher here. Love the red toolbox. I can’t pass up old tins or canisters. Ever. Even if they cost a million dollars (kidding. I don’t have a million dollars). You know what I mean though, right? The graphics are always so great and inspiring and cute. What’s a girl to do? 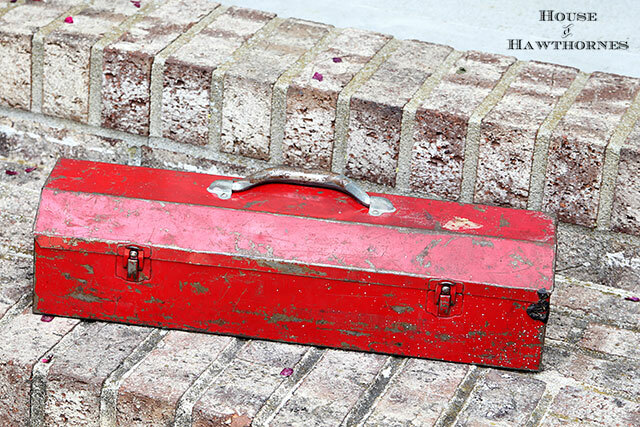 How about putting that toolbox in the garden or your flower beds and using it to hold handheld garden tools and gloves? When I grew up, my parent’s bought coffee in bags, eight o’clock and we ground it at the grocery store. But, sometimes they needed to buy it in a can. Those opened with a key, removing a strip of metal. Many a finger was cut. Other things came in cans with a key. Sardines (uck), Vienna sausage (loved those little devils! ), Spam! not sure if your tool box is wide enough for this but I think it would look cute on your dining room table or bar with mason jars inside holding fresh flowers! Great finds, Pam! 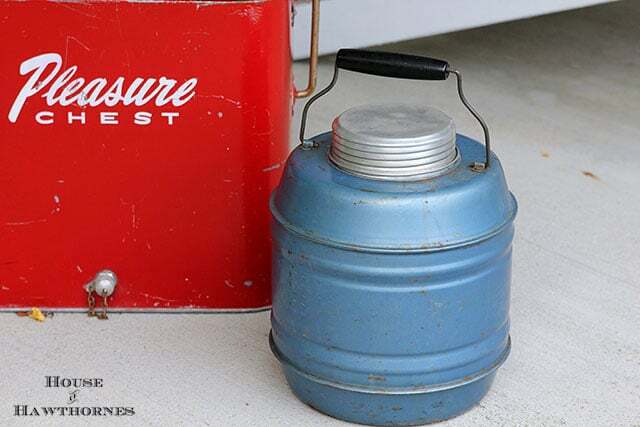 I love old tins and have a collection of old coffee tins in my pantry. 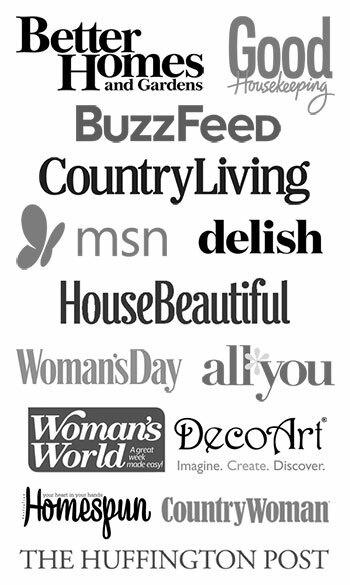 You already have some great suggestions for that toolbox….can’t wait to see what you choose. Keep making those awesome finds!!! I love the old tins in all my favorite colors! 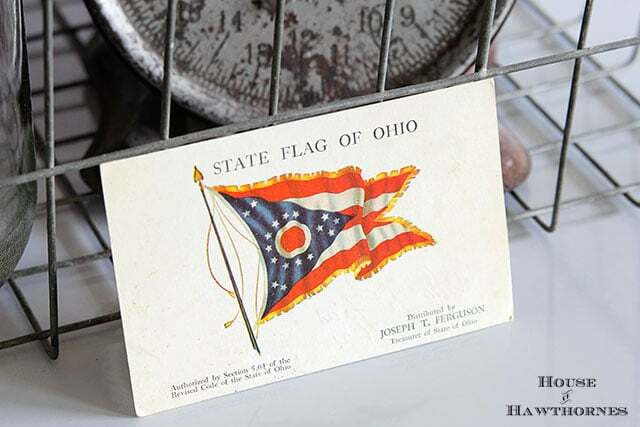 I haven’t come across any good tins in a long time, so they must all be in Ohio. Love the postcards, too, and the memories you’ve got to go with them. Adorable finds. Super cute picnic jug! No idea what you should do with another tool box. I have quite a few around here as well, so I’ll be interested in what you come up . 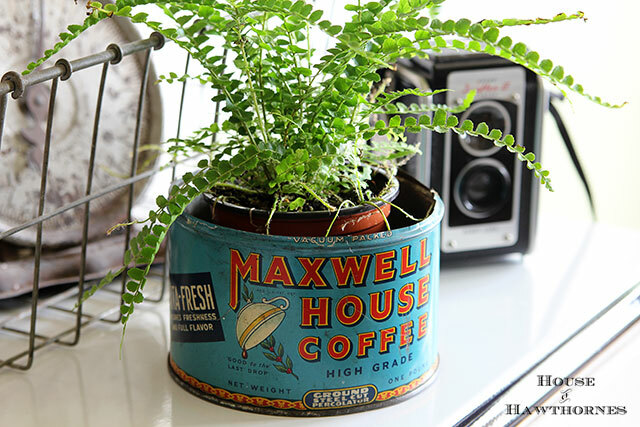 I love all the unique things you find–I love the coffee tin! I use everything as a planter so I am not much help with the toolbox. I have faith though–you will think of something amazing! I love that coffee tin! I am always looking for these. Pam, I love all your vintage finds. I would put knitting needles and crochet needles in that tool box. 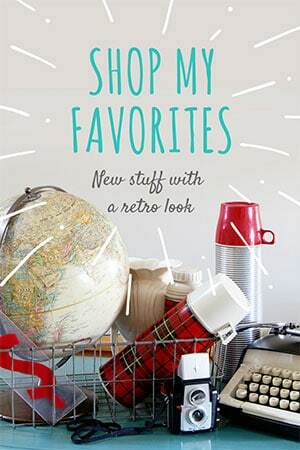 Check out my blog I have started a vintage find showing on my right side bar. New addition a really old baking powder can.